Premise: Two female contestants compete in a series of four rounds where they must predict the answers to questions based on a survey of 100 men with the help of a panel of three “celebrity advisors”. In the first round, three multiple choice questions will be asked based on a survey to men in general with each correct answer worth $200. In the second round, three more multiple questions will be asked worth $300 each. The first two will be based on a survey of specific groups of men and the third is deemed as the “VIP Question”. VIP Question is a multiple choice survey question asked to one particular man. The contestants will have chance to get to the guest a little bit more by the celebrity panel asking him as many questions as possible in 30 seconds. In the third round, Male Order, each contestant will have to organize a list of three items based on the question with the help of one celebrity advisor. One item in correct position is worth $100 and placing all three items in the correct positions will earn the contestant $500. In the fourth round, Men’s High Five, both contestants will be asked a survey question followed by five answers. The goal is for the contestant to find the top answer on the board. The contestant would won the most cash going into the round would earn the advantage of choosing two answers on the board. The contestant whose answer ranked the highest won the game and played in the $10,000 Tag Team bonus round. In the bonus round, the contestant and her choice of one celebrity advisor will have 30 seconds to answer seven “either-or” questions correctly by guessing what most men would prefer in a given pair of items. Each correct answer earns the contestant $300 and seven correct answers will win the contestant $10,000. With the sudden success of NBC’s Hollywood Game Night reviving the “celebrity game show” format, it’s no surprise that there are producers in the weird and fickle world of television who are attempting to absorb some of its audience by adapting star-studded show of their own. Celebrity Name Game will be debuting in national syndication this fall, Disney’s Win, Lose or Draw premieres next week with Disney Channel stars playing along and a new game show called Wall of Fame is in the works with a panel of celebrities with their pre-recorded responses. The key elements to making this type of game show work is to properly incorporate the stars in the gameplay and have them engage well with each other, the contestants and host. As being GSN’s most recent original game show to feature a celebrity presence, Mind Of A Man will have a good chance of bringing in some of the aforementioned audience with viewers in the age range of late-20s to early 40s. While Mind of A Man does not have a wide list of household-name celebrities, the show’s current roster of celebrities (based on the episode I had previewed featuring Skyler Stone, Kim Whitley, Alonzo Bodden) has shown that they can bring enough comedic energy to the show to the point where the lack of “big name” stars is not even a factor. Although the game can still be played without celebrities, that factor adds to the show and does not overpower the presence of the civilian contestants. 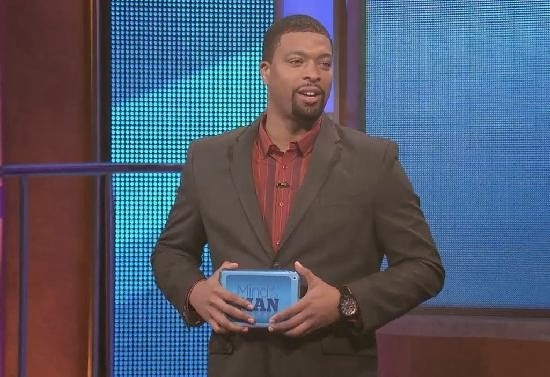 As host, DeRay Davis does a good job of carrying the show and entertaining the contestants and celebrity guest stars. I also like how he is very comfortable on stage and how he focuses more on the game rather than trying to self-advertise by trying to land every joke as if he were doing one of his stand-up routines. As far as the gameplay is concerned, Mind Of A Man is a solid show with great variety in each round and a unique twist on a tried and true survey-based format. The questions are thought-provking and challenging to say the least, albeit some of them are risqué, but are in good taste for television standards today and not a deal breaker. The VIP question is a great idea to give special guests their “15 minutes of fame” in the spotlight, whether they are a crew member on the production team or a celebrity guest. The cash at stake in each round is well distributed and leaves contestants enough room to make a comeback in the final round if they happen to fall terribly behind and I like the $10,000 grand prize, although, to some, it doesn’t have the same appeal as it did in the 1980s. The only changes I would make in the main game are the pace and reorder the third, fourth and bonus rounds. In reference to the show flow, Mind Of A Man shows the demeanor of a casual game show, but the host shows tendencies to rush through the show at times such as not allowing time for the contestants to explain why they had given their answer to every questions and rushing through the answer reveals. With this being said, the show could reduce the number of noticeable edits seen in each episode to make each show flow smoother. However, I do appreciate the producers deciding against using corny and gimmicky build-up, suspense music for answer reveals. The quick-fire, “This or That”-style bonus round with the contestant’s choice of a celebrity partner to assist them is a nice touch for this show to add some suspense and excitement as well as keeping you on the edge of your seat with close, last-second, buzzer-beater wins. However, here’s how I would order the last three rounds of the show: Men’s High Five with the same rules with the addition of increasing dollar values for each of the top five answers, Tag Team and Male Order. The Tag Team round would be placed in the fourth round in order to create more exciting finishes in the last few seconds in the front game. This Male Order bonus round would be played the same except the contestant and celebrity advisor would have to order five items instead of three and the team would have up to two chances to organize the list in the correct order (otherwise, it would be frustratingly difficult to win like the end game on How Do You Like Your Eggs?). If the contestant did not get all five right on their first attempt, they will be notified of how many items in the list are place in the correct position and would be given a second chance. The contestant could win the same $10,000 for five correct answers, $1,000 for three correct, $500 for two correct and $100 for one correct. As far as the set is concerned, the nightclub/lounge setting, complete with a bar, perfectly compliments the show’s casual party environment. The two improvements that could be make are changing the “Mood On Money” lighting sequence from red to green to better suit the catch phrase used in the bonus round and to add readouts to the contestant’s podiums to display the contestant’s scores rather than using a small lower third graphic. It’s been done before with past low budget game shows (Street Smarts, for example) and it can work with this show by simply adding two borderless monitors between the contestants’ seats. The one other issue I have with this show is Ted Lange’s minimal role on the show. Lange acts as the bartender and as an extra resident panelist. While I do like the producer’s decision of adding him to the show because of his famous occupational role on The Love Boat, Lange doesn’t really serve a major role due to his limited airtime of about one minute maximum per episode. His appearance seems to be simply a ratings stunt to draw in more older, nostalgic viewers. If Lange were to share his input more often, then his appearance would be justified. Overall, I’m impressed with the premise and execution of Mind Of A Man. This is another game show that reminds us all why celebrity panel game shows were successful back in its heyday. Panel and survey shows are always entertaining with the right stars and its very difficult to mess up that type of format. However, some viewers might find this show coming across as a little too raw and unhinged and is definitely not a show for viewers under the age of 16. Mind Of A Man has very good entertainment value with its interesting and humorous survey questions, variety in gameplay, a good roster of funny and lively panelists and a respectable grand prize. I will be looking forward to watching more episodes of this show in the future. Judging from the episode I had seen, I believe this show is good enough for a second season renewal, at the very least. On an end note, it would be interesting to see if the show will do a special series of “Mind Of A Woman” episodes. Just a thought. Watch new episodes of Mind Of A Man every Wednesday night at 8:00pm EST on GSN!